Vanilla Dome is the third world in Super Mario World. Being located in the underground, Vanilla Dome features predominantly underground levels. Like Donut Plains, Vanilla Dome has a hidden link to the Star Road. There are two paths one can take in this world. 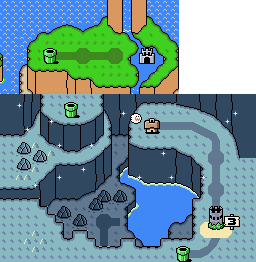 The regular path leads to Lemmy's Castle, however by finding the secret exit in Vanilla Dome 1, one can find an alternate path that takes one to the surface. This skips the Ghost House and Lemmy's Castle completely, but instead you'll have to go through the Vanilla Fortress. Which way you choose will determine where you end up in the next world. This page was last edited on 25 July 2013, at 16:09.